About three months ago, I was introduced to Skora Running Shoes for the first time. I had heard of them, but I hadn't tried them. 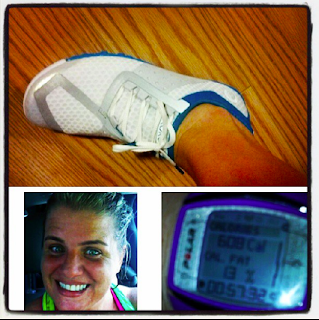 I was at FitBloggin' and my roommate, Kyndra from Peace Love and Low Carbs told me all about them. She said that she loves them for running, and she also said that they were great for CrossFit workouts. When I got home, Skora Running contacted me and asked if I would like to try their shoes and offered a giveaway. I jumped at the chance. The first thing I did was head over to their website. I wanted to learn as much as I could. Last year I hurt myself by jumping into a different pair of shoes I wasn't used to. I was pleasantly surprised by what I read. My Skoras with my Shubeez tag! "At SKORA we view Real Running as running how nature intended — efficient, effective and with ease. As the foot strikes the ground, contact is made in the middle of the foot, not at the heel. Running with a whole-foot gait results in less impact energy and force shock transmitted through the body than compared to the heel strike gait favored by conventional running shoes (built with large amounts of cushioning, support and a thicker heel). Real Running is not something your body needs to learn, but rather be reminded of. As a child we all Run Real, it is only as we grow up and get used to conventional running shoes we forget how to run naturally." I love this because Skora Running is taking me back to the basics for running. But I also know that I can flip tires and do CrossFit workouts at CrossFit Blackbeard too. That is a good thing. I love the minimalist idea and I always hear rave reviews about Skora. Hope I win! They are pretty great! Good luck! I love the company's attitude toward running and I've heard great things about the shoes. Intrigued by the minimalist, zero-drop concept. It's a totally different but natural feel for running. When I wear them and don't run, it takes some getting used to. Too comfy! I can't seem to enter your contest =( I would love an opportunity to win a pair of Skora's! I've been wanting to try them for months. Please let me know what I am doing wrong!!! I got it :) I went through Facebook instead. Thanks for the great giveaway! Looking forward to following your journey! Growl, I can't get it to work! Will have to try on my desktop computer and see if that helps. I would LOVE to win a pair of these shoes. Have heard great things about these shoes! Would love to try them. 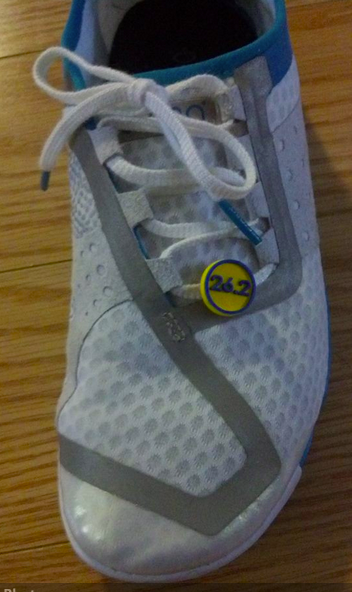 I have just started running in minimalist shoes. I absolutely LOVE them! I've been reading about them more and this brand keeps popping up on my radar! Would love to give them a try! The sole of the shoe really appeals to me. It looks like great protection with minimal impedance to foot movement. Looks like things are working now... I would love to try some minimalist shoes and I have heard great things about Skora. They are cute, too! They seem like really great low profile shoes!! Love skoras! Thanks for the opportunity to win a pair! I was very nervous about trying a minimalist shoe but I LOVE SKORA! I LOVE Skora because they are made for runners! I love how they are minimalist and very cute! Love the look and I'm intrigued! Like the looks. Would love to give them a try! I love that they've brought running back to the basics and make it feel like a more natural experience! I like the basic look and yet love that they are worn by some pretty serious athletes. Always on the lookout for minimalist options for crosstraining! I don't really know much about Skora, but all I hear is positive feedback! I'd love to try them! Thanks for hosting this giveaway! I'm too nervous to spend money on a minimalist shoe... fingers crossed a giveaway can be a safe introduction to the concept! I would love to try Skora! Love the idea of the 'real running'.....zero drop but still with some cushion...and of course the wide toe box! I've never used Skora before but I like the look of the shoe and the minimalist style. I love the look of them... not that running has anything to do with fashion, but I think they are fashionable... probably very comfortable. I am always up for trying new shoes! I have switched my style of running so I am curious how Skora would work! They look great! Love the minimalism (and the CUTE FACTOR doesn't hurt either :) )!! I love all the amazing reviews I have heard about them. I would love to try them out. I haven't had the opportunity to try Skora but would love to!!! Love the look and would love to try! I love mine!! I wear them everywhere, except work, and though they give you a very different work out for your feet, they are insanely comfortable to work out in. I love the look of the Skora running shoes - very cute! I've been trying to find a more natural shoe and have just about decided Skora is my next try - certainly looking forward to finding what works! I'm really interested in the offset lacing. Different ideas, different concept and love the looks of their shoes. I have been wanting to switch to minimalist shoes for shorter distances in order to help my form. These sound awesome! I am so intrigued by Skora! I've been running minimal for years and would love to try a pair. I like the unique look of the shoe. I've heard these shoes can last for miles and I want to give them a run for their money!!! I love that their company is VERY active with their fans! I literally tweet them every day about their company! I like Skora because I have read that they last a long time. Everyone is telling me to try Skora. I ordered some once but realized you couldn't "run" in them and send them back. I'd love to be able to just try running in a pair! Skora designs are really fun! I love my VFFs, but am willing to try out Skora! Big fan of the minimalist designs. I hope to run in minimalist shoes one day...currently on orthotics.